I have a not-so-secret I'd like to share. I love Indian food! Seriously. Nothing tastes better than Paneer Masala served with Basmati Rice. Especially if I can enjoy it with a warm cup of Chai Tea. I was making my very own blend of Chai Tea a while back and realized that every spice I added was an amazing powerhouse of herbal potential. From the ginger, to the black pepper, and even to the tea itself. So I pulled out my Garam Masala seasoning and looked at the ingredients, sure enough all of those spices are amazingly beneficial herbs as well. There is one herb that both of these blends have in common that lends it's distinctive flavor to both food and drink, and it works extremely well to help aid digestion and sooth the stomach, which is very important when talking about Indian food. 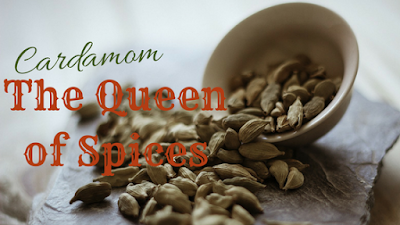 Often called “The Queen of Spices,” Cardamom is the third most expensive spice in the world, only after Saffron and Vanilla. Elettaria cardamomum is it's scientific name and it belongs to the same family as Ginger and Turmeric, the Zingiberaceae family. Originating in India, it's been used both medicinally and culinarily for thousands of years. It was even commonly used in Ancient Egypt. However, it remains one of the more distinctive spices in Indian cuisine. Carminative, stimulant, aromatic, diuretic, antispasmodic, anti-inflammatory, antibacterial, antiseptic, and aphrodisiac. Traditional Chinese Medicine (TCM)- Known as Sha Ren, the use of Cardamom in Traditional Chinese Medicine goes back to the Tang Dynasty (618-907 AD) where it was written about in an ancient book named Yao Xing Lun. This book is devoted to the pharmacological uses of herbs. According to TCM practitioners, Cardamom is spicy, warm, and aromatic. It is associated with the meridians of spleen, stomach, and kidney. It helps to resolve dampness, promote appetite, activates qi to resolve stagnation in the middle burner, warm the spleen, stop diarrhea, and prevent miscarriage. Ayurveda- Cardamom pacifies all three doshas and is most commonly used for diseases where there is an imbalance in all three doshas. It's also one of the ingredients in Chyawanprash, a traditional Indian jam used for it's nutritive and health properties. It also regulates digestion and improves urine output, so that it is commonly used in Ayurvedic weight loss formulas. People looking to balance Pitta should consume Cardamom in smaller amounts. However, it works well to balance Kapha, especially in the stomach and lungs. It also is excellent at pacifying Vata. The volatile oils in Cardamom help to soothe the stomach and intestines. This helps to prevent and reduce a whole host of digestive complaints including constipation, diarrhea, indigestion, and flatulence. Aromatically, it can also be used to increase appetite. Cardamom is high in fiber which helps to enhance heart health in general, but specifically helps to lower cholesterol and blood pressure. Combined with the levels of heart healthy antioxidants present in this herb, Cardamom is an excellent heart herb. Many heart experts around the world even go to far as to add Cardamom to their meals. The volatile oils in Cardamom are uplifting and soothing, helping to relieve stress and reduce depression. It can be used in a tea or aromatically to help in this manner. Cardamom is high in manganese, a mineral found to lower the risk of diabetes. Cardamom is well known for it's ability to combat bad breath, simply by chewing on the seeds. It also helps to fight the bacteria that cause tooth and gum disease and decay. Cardamom has been shown to have bronchodialatory effects, meaning that it dialates the bronchi and bronchioles in the lungs. Literally, Cardamom makes breathing easier. Especially in the cases of asthma patients. Cardamom has an amazing ability to sooth a sore throat, reduce inflammation, reduce nausea, and prevent vomiting. Cardamom is rich in cineole, which helps to increase and release your passions. Just a tiny pinch of Cardamom can go a long way. Cardamom is useful to help with the discomfort associated with passing kidney and gall stones. It can also act as a diuretic to sooth a wide variety of kidney, bladder, and urinary problems. Cardamom is one of the few herbs that is really helpful in most cases of hiccups. It has muscle-relaxing properties that help sooth the muscles that contract to cause the hiccups. It also helps reduce indigestion which can be another cause of hiccups. Simply add 1 teaspoon of powdered Cardamom to a glass of hot water, let steep 15 minutes, then consume slowly. Contraindications and Warnings- Generally considered safe, but some people do have allergies to the volatile oils. Cardamom has anti-platelet actions and could possibly cause problems in people taking certain anti-platelet or anticoagulant medicine. I only included a basic introduction to this amazing herb. I hope you have learned a new appreciation for how amazing cardamom is. If you have any questions or comments, please leave them below.